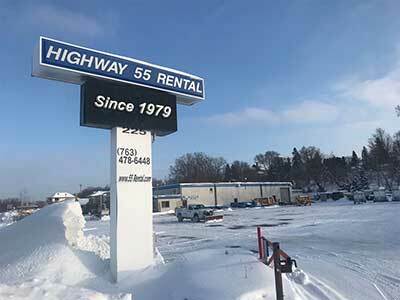 55 Rental is a family owned and operated business providing trucks, trailers, equipment and much more to the Twin Cities Metro Area for over 40 years. Customers have come to count on us as their one-stop-rental shop given our extensive selection of bobcats, wood chippers, saws, trucks and trailers and the complete service experience we provide. The majority of our full-time staff has over 15 years of rental experience making Highway 55 Rental uniquely qualified to handle all homeowner projects or large contracting jobs. As a full-service rental center, we help customers load equipment when they arrive to pick it up, as well as offering delivery and pickup when requested. We also have a service center for repairing small engine machines, such as lawn mowers and snow blowers. We stock a large inventory of moving equipment like enclosed and open trailers and different size box trucks and lift gate trucks. Our equipment is clean, well-maintained and is always replaced or updated when it no longer meets our stringent standards. After 4 decades in business, we’ve learned to only purchase the highest level, commercial grade equipment available, knowing that it is money well-spent. We also closely monitor industry trends and listen to customer requests for new items we don’t currently offer. Doing so has earned us a reputation for often being the first to offer unique items the competition doesn’t. Beyond our wide range of inventory and services we offer, it is our company’s core values and commitments to the customer, our staff and the local community that have provided us the privilege of serving our loyal customers for over 40 years. We encourage you to read our commitments below and always welcome your feedback to ensure we continue to honor them. When customers call 55 Rental, they can expect to get a live person on the phone who is ready to answer initial questions on availability and pricing. Whether on the phone or in person, our experienced staff will help guide customers to the equipment they need to best complete a DIY project or to take on a large scale project. We do this by approaching each customer interaction as a conversation rather than a transaction, first by listening to the customer’s needs and secondly by asking the relevant questions required. This best ensures they receive the right type and quantity of equipment to suit their unique project. Doing so not only gives peace of mind to our customers, but also helps them avoid spending money on an unnecessary item or renting more equipment than they may require. When customers arrive to pick up equipment, they can expect to have their contract written up efficiently and our courteous loading staff will be there to help load the customer’s equipment and give full instructions on how to operate the equipment. Upon drop off, we also help the customer unload the equipment and get them on their way as quickly as possible. We will also hook up a trailer when required and do a full walk around trucks to ensure we explain the proper instructions on renting and using our trucks and trailers. Even after 40 years in the equipment rental business, we still continuously strive to improve the customer experience through staff training and regular maintenance and updating of equipment. However, as in any business, mistakes can be made and sometimes rental equipment does not perform as expected. When this happens, we ask that the customer call us as soon as they notice an issue to maximize our company’s ability to effectively resolve it as quickly and efficiently as possible. We believe that a company’s customer service is often best demonstrated by their ability to effectively react to problems or unforeseen circumstances, and pride ourselves on doing so to the best of our ability. In the event that an issue fails to be resolved in a timely manner, we work with the customer towards a fair and reasonable reconciliation based on each individual situation. Thank you for valuing our commitment to customer service as much as we value the opportunity to provide it. As a family-owned and locally-operated company, hiring and maintaining a knowledgeable and dedicated staff is essential to properly serving the thousands of customers we do business with each year. Because of this, we are proud to employ a team of the hardest working, experienced professionals in the industry. That the majority of our full-time staff has been with us for over 15 years seems a worthy testament to the value we place on them as the lifeblood of our company. We believe this level of loyal dedication is directly responsible for the quality experience new and long-term customers have come to expect when they reach out to us for their rental needs. In addition to offering industry competitive wages and cultivating individual growth, we also provide additional opportunities for after-hours work and paid holidays. Last but not least, our company takes safety very seriously. We take care to properly train our staff on the various pieces of equipment and tools they work with daily to minimize the potential for injury. Each employee is trained properly on how all the equipment runs so you can be sure you are getting a thorough explanation on operation and safety measures with each piece of equipment. Built in an area where horses, fields and farmhouses were once as common as cars, homes and retail businesses, Highway 55 Rental has witnessed the rural town of Hamel evolve into a city that sees over 10,000 cars pass through it each day while new homes and businesses are built every year. Yet at the heart of all this growth, it is the people, organizations and companies who have given their time and resources towards causes greater than themselves. Since the early days of sponsoring local Little League teams and participating in the Hamel Rodeo parade to continuing to support charity organizations and volunteer efforts, Highway 55 Rental takes its commitment to supporting the local community seriously. This support has been reciprocated in helping to build a customer base made up of great companies and outstanding people. We specially train our staff to always offer lower cost solutions to help homeowners and contractors alike to stay within their budgets. We attempt to support as many as we can based on availability of equipment, current market forces, and the local scope of impact that the donation will provide. Thank you to all of the individuals and fellow businesses who volunteer their time and resources to local community efforts. We are grateful to have done business with so many of you over the years and look forward continuing to serve you and the many worthy causes and programs that support those who need it most.